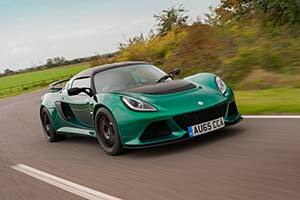 As the ultimate incarnation of the world famous Exige, Lotus has revealed the Sport 350, the latest version of the class-leading and award winning sports car, that's lighter and faster than ever before. Te new Exige Sport 350 is the next model in the range to mark the reintroduction of the renowned 'Sport' naming designation. It joins the recently announced Lotus Elise Sport and Elise Sport 220 - delivering a lighter and even more performance-focused driving experience. Concentrating on what Lotus does best, and with a focus on pure performance, the two-seater has been developed to deliver an unrivalled experience for the driver, being sharper and more direct than previous models. Drawing on the core elements that have made the Exige a firm favourite with driving enthusiasts, the Exige Sport 350 combines Lotus' lightweight extruded aluminium chassis structure with muscular and aerodynamically efficient composite bodywork. A product of Lotus' 'Lightweight Laboratory', the Exige Sport 350 weighs just 1125 kg and has shed 51 kg compared to the previous model Exige S. This reduction in mass is the result of a thorough re-evaluation designed to deliver a pure driving experience. Lotus engineers weighed every component in the previous Lotus Exige S in order to save weight, the result of which includes, amongst many other changes, the introduction of a louvered tailgate panel, a lighter battery, lightweight engine mounts, a lightweight centre console featuring an exposed gearshift mechanism, lighter HVAC pipework and the optimised use of sound insulation. Jean-Marc Gales, CEO of Group Lotus plc, commented: "The Lotus Exige is already regarded as one of the world's best sports cars and a benchmark for performance and handling both on road and on track. With the Exige Sport 350 we took an already phenomenally quick car and made it even faster, more dynamic and more pure, perfectly demonstrating our Lotus design philosophy of 'lighter and faster'." The 3.5-litre supercharged V6 engine generates 345 hp and 295lbft of torque at 4500rpm, offering scintillating, progressive power to the road, while revised suspension tuning and wheel geometry contribute to un-matched vehicle dynamics and steering precision. Coupled with the car's lower mass, this power and torque enables the Lotus Exige Sport 350 to accelerate to 60 mph in just 3.7 seconds (0-100km/h in 3.9 seconds) before reaching a top speed of 170 mph (274 km/h). The manual gearbox has been heavily revised, giving more precise and quicker shifting. The gearshift mechanism uses light weight machined and cast aluminium components which are so technically aesthetically appealing they are no longer hidden within the transmission tunnel but exposed through an open-gate design, further reducing weight. The Lotus Exige Sport 350 is also available with a 6-speed automatic option where drivers can change gears manually via forged aluminium paddles located behind the steering wheel, or rely on the gearbox's fully automatic mode. The automatic gearbox control panel is integrated neatly into the centre console of the cockpit, with buttons for Park, Reverse, Neutral and Drive. Up-shifts take just 240 milliseconds, with rapid downshifts accompanied by automatic throttle-blip (when in Sport mode). When fitted with the optional automatic gearbox, the new Exige Sport 350 is slightly quicker for 0-62 mph (0-100km/h), clocking a time of 3.8 seconds against 3.9 seconds for the manual gearbox, due to electronically optimised gearshifts.